Biking in cities doesn’t have to be hazardous to your health. But in Istanbul, you must be extra careful. 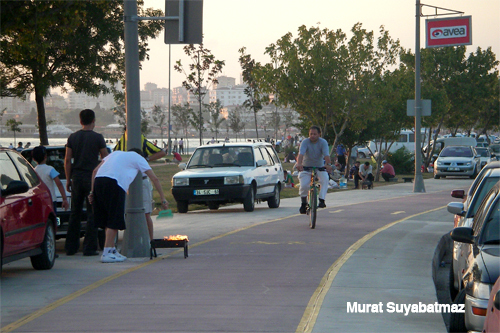 Besides traffic and air pollution – the usually problems faced by urban cyclists – Istanbul riders have to deal with flooded cycle paths, barbecues, trees, bushes, and garbage bins in cycle areas, and lack of bicycle parking. 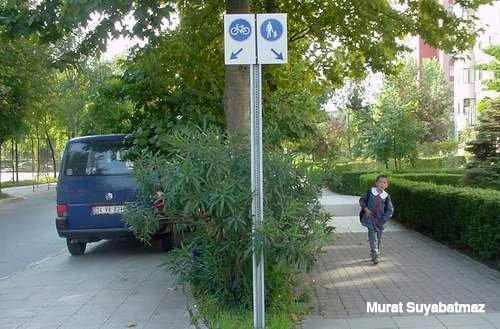 But even with these problems there’s still reason to be excited about biking in Istanbul. 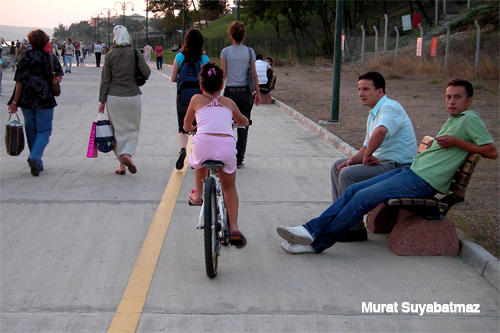 Recently, Gizem Altin, a Turkish cycling advocate, organized Istanbul’s first ever symposium on urban cycling. In attendance was a representative from the city government who announced that Istanbul could have 101 km of dedicated bike lanes right away without any major structural changes, if the mayor were to give his support. The city official also talked about the city’s master plan for building 670 km of bike lanes. But alas, there is no time frame for such a project, an indication that it might never be implemented. 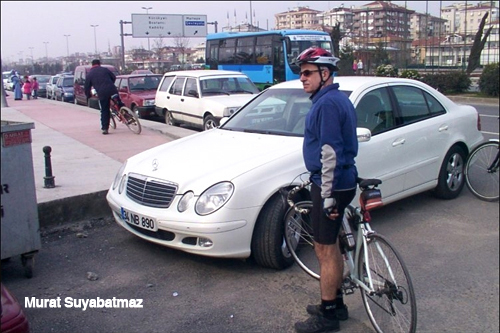 In the meantime, cycling in Istanbul continues to be an extreme sport. 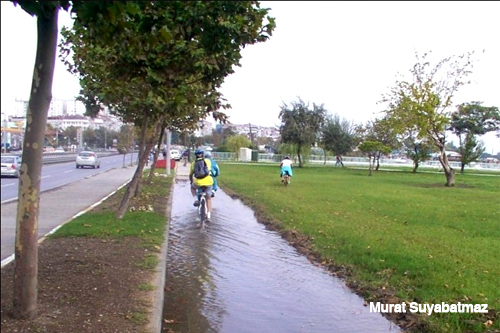 After the leap, check out the photo essay on biking in Istanbul by Murat Suyabatmaz, a Turkish cycling advocate who also attended the bike symposium. Because space is shared by pedestrians and cyclists, this little girl must constantly swerve around strolling pedestrians. It’s a recipe for disaster. 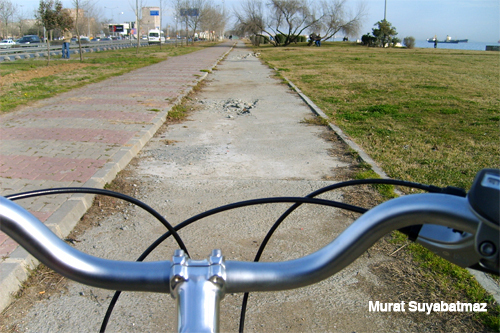 This is a very rare site, a dedicated bike lane in Istanbul. 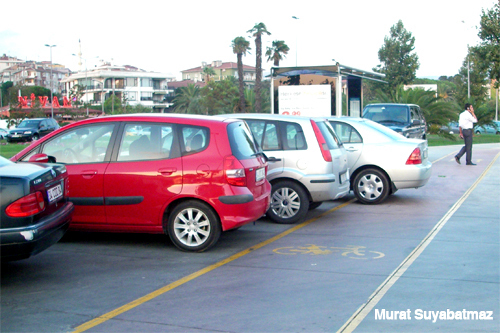 It’s differentiated from the street and sidewalk by its red color; it’s also elevated to protect cyclists from traffic. But many people don’t respect it, and some even have the gall to barbecue on it, like these men above. What’s more, on the left of the photo, the pedestrian zone has been completely invaded and occupied by cars! Cars failing to respect the bike lane. More of the same on the left hand side of the photo. A poorly maintained cycle path is scarred with potholes and sink holes.